1.41 How to Apply for FCI Recruitment 2017-18 online? Are you looking for Latest FCI Notifications? Don’t worry; you are in the right place. Food Corporation of India releases its notifications on their official website, i.e., www.fci.gov.in or FCI Job Portal. Generally, FCI releases its recruitment notification zone wise such as North Zone, South Zone, West Zone, East Zone, Northeast Zone, etc. Currently, there are vacancies in its Kerala, Rajasthan & Karnataka regions. So, now it has come up with Food Corporation Recruitment 2017 for filling the vacancies of 127 Watchman posts for its Kerala region & 117 posts for its Karnataka region along with 281 watchmen posts for its FCI Rajasthan, 271 Watchman Posts for AP Region, and 860 Watchmen posts for Punjab Region, 114 Chowkidar Vacancy in FCI Chhattisgarh, 82 Watchman Jobs in WB FCI. The region wise detailed notification is enclosed below. Every year, FCI publishes various notifications for providing employment opportunities to the unemployed youth. So, the Food Corporation of India has released this notification under the Advertisement no. FCI-KER/01/2017. Postulants who have completed their 8th class from a recognized Institution are only eligible for this Latest Food Corporation Vacancy. Hence, Interested and Eligible candidates can apply for this FCI Watchman Recruitment 2017 on or before 15th July 2017. One can also download the FCI Watchman Notification 2017 in the pdf format below. Food Corporation of India (FCI) is the government of India owned corporation, which is amongst the largest corporations in India and one of the largest supply chain management in South Asia. Each year, the Food Corporation of India purchases around 15 to 20 percent of India’s total wheat output and about 12 to 15 percent of its rice output. Food Corporation of India operates under the ministry of food and ministry of agriculture. FCI operates in 5 zones throughout India which are North Zone, East Zone, West Zone, South Zone and North East Zone etc. Also, check Latest ESIC Vacancy here. Food Corporation of India Uttarakhand Region has released a notification for filling the vacancies of Chowkidar posts. As per this FCI Uttarakhand Recruitment 2017, there is a total of 47 watchman posts. Job hunters who are looking for the Govt Jobs in Uttarakhand can grab this opportunity. Interested candidates can apply for these FCI UKD Group IV jobs from 15th November 2017. The last date to apply online is 14th December 2017. To avoid the last minute rush, I advise you to apply well in advance not to wait until the last date. We also suggest you to check their eligibility before going to apply for the Uttarakhand FCI Recruitment 2017. Age relaxations are applicable for reserved categories as per the rules. The postulants of the FCI Uttarakhand Recruitment 2017 have to pass the 8th class exam from the recognized board. SC/ ST candidates – No Fee. For further more details of the Uttarakhand FCI Watchman Recruitment, refer the notification that was attached below. How to Apply for 47 fcijobsukd.com Watchman Jobs? Those people who satisfy all the eligibility requirements are allowed to fill the FCI Uttarakhand Watchman Application Form in online mode using the below link. FCI Haryana region has recently released a notification with no. 1/2017/Haryana. As per this FCI Haryana Recruitment 2017, there is a total of 380 Watchman posts available in Panchkula region. The apply online link of FCI Watchman Recruitment 2017 Haryana Region will be activated on 5th November 2017, 10.00 a.m. Individuals looking for Government Jobs in Punjab must utilize this opportunity without any hesitation. Interested candidates can apply online for FCI Haryana Watchman Recruitment 2017 before 4th December 2017. But I advise you to check the eligibility before going to apply for the FCI Haryana Vacancy. Go through the below sections for more details and steps to fill FCI Watchman Online Application. A Middle Standard Pass (8th Class Pass) is required to apply for FCI Haryana Recruitment 2017. SC/ ST & others: No fee. The Food Corporation of India, Uttar Pradesh advertised a new notification to fill up 408 Watchman (Chowkidar) Posts. Aspirants who are in search of the UP Govt Jobs can utilize this chance on or before 6th November 2017. For the FCI Uttar Pradesh Recruitment 2017, the board is inviting online applications from the 8th Pass Candidates. And, the Food Corporation of India, UP will conduct the written test for the postulants in order to select the eminent aspirants for the UP FCI Recruitment. Look at the below sections for more information of the FCI UP Watchman Recruitment. 8th Passed contenders are eligible to apply for the UP FCI Jobs. For General Candidates – Rs.300/-. 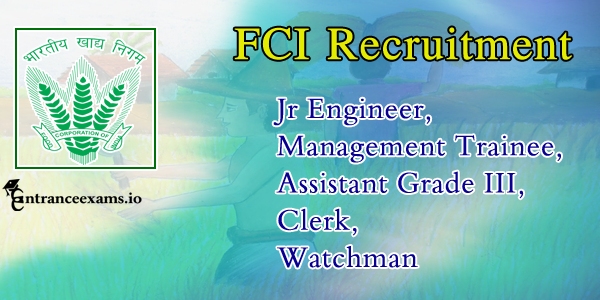 How to Apply for FCI UP Watchman Recruitment @ fciupjobs.com? Aspirants who are eligible for the FCI Vacancy in UP should apply only through online mode. Know further details of the UP FCI Recruitment 2017 in the notification. For the sake of the applicant’s, we have enclosed the notification below. Here is the good news for the candidate resident of Odisha. The Food Corporation of India is going to conduct Latest Recruitment for 49 Watchman (Group D) Posts in Odisha Region. Hence, aspirants who are in search of the Odisha Govt Jobs can apply online for the FCI Odisha Watchman Recruitment 2017 before 18th October 2017 till 8.00PM (IST). As per the official notification, the 8th pass candidates are allowed to fill the Odisha FCI Watchman Application Form through online. Go through the below sections for more details of the FCI Odisha Chowkidar Recruitment 2017. Applying aspirants should possess 8th Standard from the Recognized Board. For General categories – Rs.300/-. For SC/ST contenders – No Fee. How to Fill FCI Odisha Watchman Application Form 2017? Eligible candidates can apply for the Odisha FCI Recruitment 2017 through online @ www.fcijobportalodisha.com until 18th October 2017 upto 8.00PM. Refer the official notification attached below for more details of the Food Corporation of India Odisha Recruitment. The Food Corporation of India advertised a new notification for filling 40 Watchman (Category -IV) Vacancies in HP Region. Hence, candidates who are searching for the Government Jobs in Himachal Pradesh can apply for the HP FCI Recruitment 2017. The board is inviting applications from the eligible candidates through online mode. As per the official FCI HP Watchman Notification 2017, the applicant’s have to complete 8th Class from the recognized board. The age limit of the applying contenders should be between 18 years to 25 years. Go through the below sections for more details. The postulants of the FCI HP Recruitment 2017 have to complete 8th Standard from the recognized board. SC/ST contenders – No Fee. For further more details of the FCI HP Recruitment, refer the notification that was attached below. The FCI MP Recruitment 2017 Notification was disclosed for 217 Watchman (Category – IV) Vacancies through www.fcimpapply.com. Job hunters who are looking for the MP Govt Jobs can grab this opportunity on or before 12th November 2017. We advise the candidates to check their eligibility before going to apply for the MP FCI Recruitment 2017. Go through the below sections for more details and steps to fill FCI Watchman Online Application. Applying contenders should pass 8th standard from the recognized university. For Reserved categories – No fee. Excellent opportunity for the Delhi Government Jobs Seekers. The FCI Delhi Notification 2017 released for 53 Watchman (Chowkidar) Posts. If you are interested in this notification, then check the eligibility requirements first from the below sections. The Food Corporation of India is inviting applications for the Delhi FCI Recruitment 2017 through online mode. The starting date to fill application form is 15th October 2017 and the last date is 15th November 2017. Further details of the FCI Delhi Watchman Recruitment 2017 such as selection process, how to apply steps are furnished below. To apply for the FCI Jobs in Delhi Region, aspirants have to pass 8th standard from the recognized board. How to Apply for FCI Delhi Chowkidar Recruitment? Those people who satisfy all the eligibility requirements are allowed to fill the FCI Delhi Watchman Application Form through online. The board provides the chance to forward your applications from 15/10/2017 to 15/11/2017. Hence, you guys hurry up and apply for the FCI Delhi Recruitment 2017 before the deadline. The Food Corporation of India in Chhattisgarh Region released a Notification for the recruitment of candidates. As per this Chattisgarh FCI Recruitment 2017, the board will select the eligible aspirants to fill 114 Chowkidar vacancies. Hence, job seekers who passed 8th Standard can apply for these Food Corporation of India Watchman Jobs 2017. The board receives the online applications from the eligible aspirants on or before 7th September 2017. We have mentioned the complete details of the FCI Chhattisgarh Recruitment 2017 in the below sections. Selection Process Written exam, Physical Endurance Test (PST). Candidates who passed 8th Standard are eligible for applying to the Chhattisgarh FCI Watchman Vacancy 2017. Aspirants are informed to refer the Official Food Corporation Of India Notification 2017 for the upper age relaxation details. How to Apply Online for 114 FCI Watchman Vacancies 2017? All the interested candidates who satisfy eligibility of FCI Chhattisgarh Watchman Recruitment 2017 should apply online on or before 7th Sep 2017. You can apply to the Food Corporation of India Watchman Jobs 2017 directly through the below link. The Food Corporation of India is inviting applications for filling the vacancies of Watchman posts. As per this FCI Punjab Watchman Recruitment 2017, there is a total of 860 vacancies available. The officials have released this Latest FCI Notification 2017 for filling the watchmen posts in its Depots and Offices that are spread all over the Punjab State. Candidates who wish to be a part of this organization can utilize this opportunity without any hesitation. Hence the Interested candidates of FCI Punjab Recruitment 2017 can apply online on or before 20th September 2017 (extended to 27th September 2017) through the official website, i.e., www.fci.gov.in or www.fcipunjabapply.com. More details about Food Corporation of India Recruitment 2017 are mentioned in detail below. As per the Food Corporation of India Punjab Watchman 2017 Notification, candidates should possess 8th Standard from a recognized board. However, the Upper Age Relaxation is applicable for the Reserved Candidates as per the norms of the Food Corporation of India. How to Apply for 860 FCI Punjab Watchman Jobs? All the interested and Eligible Candidates of FCI Punjab Watchman Recruitment 2017 can submit the online application through the official portal between 21/08/2017 to 27/09/2017. One can also apply online for this FCI Punjab Recruitment 2017 from the below active link. Click here for instructions to apply online. There are various posts released by the Food Corporation of India such as Management Trainee, Junior Engineer, Assistant Grade & Typist, Watchman, etc. For these FCI Vacancies, applicants must have done graduation degree/ MBA/ Degree in (Civil, mechanical, electrical) engineering, Diploma Degree/ Graduation degree, B.SC, Bachelor degree & typing speed in Hindi or English Respectively From recognized university or board. Here we will provide the List of all upcoming FCI Notifications. We ensure that none of the FCI Jobs get missed out in our website. Here we will provide the List of all upcoming FCI Notifications. We ensure that none of the FCI Jobs get missed out in our website. We help both fresher and experienced graduates to get a notification on Upcoming FCI recruitment 2017 openings across India. So, the candidates who are willing to be a part of this organization must grab this opportunity and apply for any of Latest FCI Jobs 2017-18. Also, check Upcoming NHPC Jobs 2017-18 here. The Eligibility criteria of FCI Kerala Region Recruitment 2017 specify the age limit, educational qualification, and nationality of the candidates. So, before applying for these 127 FCI Watchman Jobs, one should read the eligibility criteria thoroughly to know whether they are eligible or not. The age limit of the candidates applying for this FCI Recruitment 2017 must be between 18 to 25 years as on 01/07/2017. However, the upper age is relaxable for reserved categories as given below. SC/ ST categories: 05 years. PWD/ PH candidates: 10 years. For PWD/ PH candidates of SC/ST category: 15 years. PWD/ PH candidates of OBC category: 13 years. Postulants applying for these Watchman Jobs in FCI Kerala Region must have passed 8th Class or must possess the qualification by 01/07/2017. Before applying for this Food Corporation of India Jobs, aspirants should have an idea about some details such as Selection Procedure, Application Fee, Pay Scale, test center, etc. So, for your convenience, I have given all those details in this section. The officials of Food Corporation of India will select the candidates based on their performance in the following rounds. Running – 1000 Meter in 05 minutes 30 seconds. Long Jump – 4.00 Meters. High Jump – 1.35 Meters. Running – 800 Meter in 5 Minutes. Long Jump – 3.00 Meter. High Jump – 1.00 Meter. Aspirants of FCI Recruitment 2017 should pay the application fee in either online or offline mode. Hence, deposit the application fee through SBI Internet Banking or Cash payment through e-challan at branches of SBI. Application fee of FCI Watchman Recruitment 2017 for various categories is given below. SC/ST/ PWD/ Ex-servicemen/ Female categories: Nil. All the selected candidates of FCI South Zone Recruitment 2017 will get a pay scale of Rs. 8,100/- to Rs. 18,070/- with allowances as per the norms of the organization. While filling the online application of 127 Food Corporation of India jobs, candidates should select the test center in three preferences from the list given below. Food Corporation of India announced the notification for Watchmen posts for its Karnataka Region. So, it invites applications from the eligible candidates who satisfy the eligibility such as educational qualification & Age limit. Get the Vacancy, educational qualification, age limit, selection process & important dates etc. No Of Vacancies: 117 Posts. The Candidates who are going to apply for the FCI Karnataka Region Category IV jobs must possess the 08th Standard. The direct link to download the notification of FCI Watchman Recruitment 2017 is given below. Here, candidates can also get the notification of Upcoming FCI Jobs 2017-18. Hence bookmark this page by pressing Ctrl+D for getting instant access to this page. The Food Corporation of India has announced the notification with advertisement no FCI – RAJASTHAN/01/2017 for hiring candidates as Watchmen for its Rajasthan Region. So, FCI invites Online applications from the eligible candidates those who meet the criteria. The FCI recruitment 2017 apply online link is available from 07-07-2017 to 07-08-2017. So, we advise all the candidates who are looking for the Govt Jobs in Rajasthan may use this opportunity and apply before the last date. Please follow the below information to get the other info like Educational Qualification, Age limit, Selection process, Exam Dates etc. No of Posts: 281 Posts. 100 Meters Race – 16 Seconds. 1.6 Km Race – 07 Minutes. High Jump – 09 Meters (3 Feet ) in 3 Chances. Food Corporation of India has issued an advertisement for its Tamil Nadu Region with an advertisement no 01/2017. This FCI Watchmen Notification released to fill up the 55 Vacant Posts of fci.gov.in. So, it invites applications from the eligible candidates those who are suitable for this FCI Watchmen Tamil Nadu Notification/Recruitment. Interested candidates may follow this post and get the complete details of educational qualification, age limit, selection process and exam date etc. As per the Notification, there are 55 Watchmen posts are vacant across the Tamil Nadu State. Category Wise Vacancy details are tabulated below. All the candidates those who are interested in applying for the FCI Watchmen Recruitment 2017 must complete the 08th Standard. The FCI Recruitment will shortlist the candidates applied for the FCI Watchmen Recruitment 2017 based on their performance in the written test followed by the Physical Endurance Test. The Officials of FCI announced the Written Examination Date for the applied candidates. The FCI watchmen exam will be held on 20th August 2017. The Qualified candidates in the written exam will undergo the Physical Endurance Test which centers will be announced later. Long Jump – 4.000 Meter. High Jum – 1.35 Meter. Running – 800 Meter in 05 Minutes. For General Candidates – Rs. 250/-. The Interested candidates those who are going to apply for the Food Corporation of India(FCI) Watchmen recruitment should submit the application form in ONLINE Mode Only. So, it is advised to all the candidates that please submit the application form before the last date to avoid the last minute rush. The Online applications are available from 17th July 2017 to 08th August 2017. Follow the below steps to fill FCI Watchmen Application Form. The Food Corporation of India published the Watchmen Recruitment Notification for its Andhra Pradesh Region. The FCI Recruitment 2017-08 Apply Online link will be available from 22nd July 2017 to 21 August 2017. So, candidates who satisfy the eligibility can apply to the Watchman Jobs before the last date. Go through the below sections for more information regarding the AP FCI Jobs such as vacancy, age limit, educational qualification, selection process, etc. Aspirants who have completed 8th Standard from a Recognized School are eligible for the Food Corporation Of India AP Recruitment 2017. For General Category Candidates: Rs. 300/-. For SC/ST/PWD/Ex-Serviceman/Female Candidates: No Fee. Refer the Overall FCI AP Watchman 2017 Notification by clicking on the below link. Check your eligibility and apply online before the last date. Stay tuned to our entranceexams.io site for the Upcoming FCI Jobs 2017-18. Here is the latest Employment News for the aspirants who are searching for the Telangana Govt Jobs. The Food Corporation of India had released a notification to hire 271 Watchman jobs. Eligible candidates can apply online from 27th July 2017 for FCI Telangana Hyderabad Recruitment 2017. To know the complete eligibility details aspirants refer the official website of FCI Recruitment 2017. Interested candidates must submit their FCI Watchman Application forms before the last date 21st August 2017. Age relaxation is applicable as per the rules of Telangana Government. For General Category Candidates: Rs. 250/-. For SC/ST/PWD/Ex-Serviceman/Female category candidates: No Application Fee. FCI Telangana Hyderabad Recruitment 2017 Notification. The Food Corporation of India had released a notification for Maharashtra Region to fill 187 Watchman Vacancies. Eligible candidates can apply online for the FCI Recruitment of Watchman jobs. The online application process for Maharashtra FCI Watchman Notification 2017 starts from 5th August 207. Individuals apply for the Watchman vacancies before the last date 5th September 2017. Aspirants can refer more details regarding the Recruitment at the official portal @ fcijobportalmah.com. Know the educational qualification, age limit, selection process in the below sections. Candidates who have passed their 8th Standard from a Recognized School are eligible for the Food Corporation Of India MAHA Recruitment 2017. For SC/ST/PWD/Ex-Serviceman/Female category candidates: No Fee. MAHA FCI Jobs Application Form 2017. The Food Corporation of India in West Bengal Region published an Employment notification for the WB FCI Recruitment 2017. As per this notification, the board is going to recruit the eligible aspirants for filling 82 vacancies of Watchman posts. Hence, candidates who wish to work in this organization can use this best chance without any hesitation. Therefore the aspirants can apply to the West Bengal FCI Recruitment 2017 through online on or before 20th September 2017. Contenders can fill up the Online Application form at the official website, i.e., www.fci.gov.in. More details about WB Watchman Recruitment 2017 are specified in detail below. According to the Food Corporation of India WB Chowkidar 2017 Notification, candidates have completed 8th Standard from a recognized board. However, the aspirants can refer the FCI Watchman Notification for the Upper Age Relaxation details as per the Food Corporation of India. The direct link to download WB FCI Watchman Recruitment 2017 Notification is updated below. Download the notification and start filling the online application by visiting the below link. The Food Corporation of India will accept the online applications from18th August 2017 to 20th Sep 2017. Before going to submit the Online application form for FCI Jobs, please read all the instructions provided in the “How To Apply” Section. For the convenience of the candidates, we provide the detailed steps below. How to Apply for FCI Recruitment 2017-18 online? Select respective region button. You will redirect to a new page. In that click on Advertisement link and read thoroughly before applying. You can also get the FCI Notification from the below link. Now navigate to Click Here to Apply link and complete the online registration process. Upload scanned copies of recent passport size photograph, signature, and other relevant documents as per the given format. Verify all your details once and click on Preview button. Finally, click on submit button and take a printout of the FCI Application form for future use. This is all about the Latest FCI Recruitment 2017. If you got useful information or like this article then do share this with your friends. If you have any doubts, then feel free to ask us in the below comment section or email at fcikerala.query@gmail.com. Also, Stay tuned for our www.entranceexams.io site for more details about all Entrance Exams, State Govt, and Central Government Jobs in India.